A compact, practical open-circuit suction wind tunnel for studying aerodynamics. The wind tunnel saves time and money compared with full-scale wind tunnels or airborne laboratories, and it offers a wide variety of experiments. 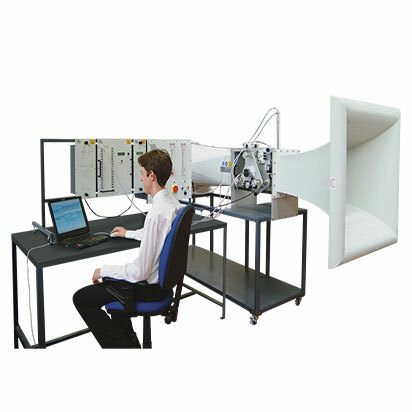 The wind tunnel gives accurate results and is suitable for undergraduate study and research projects. TecQuipment offers a comprehensive range of optional models and instrumentation, including a computer-based data acquisition system. Air enters the tunnel through an aerodynamically designed effuser (cone) that accelerates the air linearly. It then enters the working section and passes through a grill before moving through a diff user and then to a variable speed axial fan. The grill protects the fan from damage by loose objects. The air leaves the fan, passes through a silencer unit and then back out to atmosphere. A separate control and instrumentation unit controls the speed of the axial fan (and the air velocity in the working section). The control and instrumentation unit also includes manometers and electrical outlets to supply electrical power to other optional instruments. The working section of the tunnel is a square section with a clear roof, sides and floor. The sides are removable. The floor and each side panel has a special position to support the optional wind tunnel models. Supplied with the wind tunnel are a protractor and a model holder to support and accurately adjust the angle of any models fitted. A Pitot-static tube and a traversing Pitot tube fit on the working section, upstream and downstream of any models. They connect to the manometers of the instrumentation unit (or other optional instruments) to show pressure. A metal frame supports the wind tunnel. The frame includes lockable castors for convenient mobility. Electronic sensors on the optional wind tunnel instrumentation can connect to TecQuipment’s Versatile Data Acquisition System (VDAS®, not included). VDAS® allows accurate real-time data capture, monitoring, display, calculation and charting of all relevant parameters on a suitable computer (computer not included).